The 54-year-old was fired by Disney 28 years ago after he made the animated short "Frankenweenie," but the studio is now distributing his feature-length remake. The 54-year-old looked like a character in a Tim Burton film -- endearingly fragile and yet also otherworldly -- with a broken arm in a sling, a big mischievous smile on his face and his hair awry like the "mad scientist" he once dreamed of becoming. Nearby was a plastic container marked "Tim's Toys," several of which had been removed and placed on a desk to make him feel at home during an extended stay in Los Angeles. There were also colored markers within reach -- he has loved to draw for as long as he can remember, and was in town talk about Frankenweenie, the animated feature for which he is now a best animated feature Oscar nominee, and on behalf of which he had attended the Oscar nominees luncheon the previous day. "You might be able to tell I was a big monster fan," Burton tells me. "I grew up watching the Universal horror movies, Japanese monster movies and pretty much any kind of monster movie. That was my genre." He also loved animation, particularly of the stop motion variety popularized by Ray Harryhausen. "I think I knew his name before I knew any director or actor names," he says. "He was probably the person that got me more interested in animation than any other form of filmmaking." 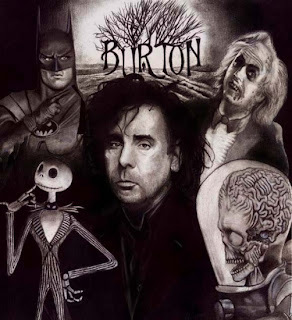 Burton was born in August 25, 1958 in southern California. His childhood wasn't a particularly happy one. He hated growing up in a suburb, was never close with his parents, and other kids found him odd. "You feel kind of different and isolated and you don't feel like you fit into your surroundings," he recalls. "It was strange. Just because you like monster movies, people though you were weird, which I always felt was an odd thing." In fact, he related to the characters at the center of movies like Frankenstein (1931): "He's perceived as a monster, even though he isn't really. He's just different." His creative outlet -- and opportunity to escape into an alternative reality -- was drawing. Despite criticism of his style from certain teachers, at some point, he says, he decided, "I'm just going to draw the way I want to draw and not worry so much about what other people think of it and just enjoy doing it as a thing." He was talented enough that, after graduating from high school, he won a scholarship to CalArts, the noted visual and performing arts school established by Walt Disney in the early sixties as a sort of farm system for his animation studio. After just a year, though, at the age of 20, he dropped out and went to work for Disney, "which seemed much more important to me at the time than getting a degree." Burton had grown up in Burbank, where Disney is based, but "even though it was close it felt like a million miles away," he says. A job there was, for an animator, the top of the mountain -- but, very quickly, he realized it was not the place for him. "I wasn't very good at their style of animation," he explains. Besides, "it wasn't the golden years of Disney animation," he says winkingly. Still, he feels that he owes a lot to the studio, because, rather than fire him, they eventually gave him "the opportunity to just draw and do different things," which was "kind of unheard of," and the work that he produced during that time -- including Vincent (1982) and then Frankenweenie (1984), two animated shorts that the studio didn't know what to do with -- led to the first major opportunity of his career: Paul Reubens, better known as "Pee Wee Herman," saw them and fought for Burton, who had never made a feature and/or live-action film, to direct Pee Wee's Big Adventure (1985). Burton's first three features -- Pee Wee's Big Adventure, Beetlejuice (1988) and Batman (1989) -- were all made while he was still in his twenties. All three were unconventional studio movies that cost little and grossed a lot, even if they weren't especially well-reviewed. "I mean, they were on the 10 worst movies of the year list," he laughs. He takes that sort of thing in stride, noting, "I've had movies that were critically well-received that didn't make any money and movies that were terribly critically-received and made lots of money, so there's never been a real consistency." What did bother him, though, was that their commercial success did not make it much easier for him to make more personal films. Edward Scissorhands (1990), he says, "was one of the hardest movies to get made," and Ed Wood (1994) wasn't much easier, even though the former film had helped to turn Johnny Depp into a bona-fide star before he tried to make the latter. "Even though I was lucky enough to have success," he sighs, "there's something about me -- I don't know what it is -- that makes them worry about me in some way or another." Burton's films shared a distinct visual language and style, tend to deal in dark comedy and often address matters of life and death. Other filmmakers have tried to replicate the "Burtonesque" approach, to varying degrees of success. But they don't have -- and never will have -- access to several of the key ingredients of his success: his regular collaborators, including Depp (with whom he has made eight films), composer Danny Elfman (with whom he has made 16), and, of course, actress Helena Bonham Carter (with whom he has made seven), Burton's girlfriend since 2001 and the mother of their two children. 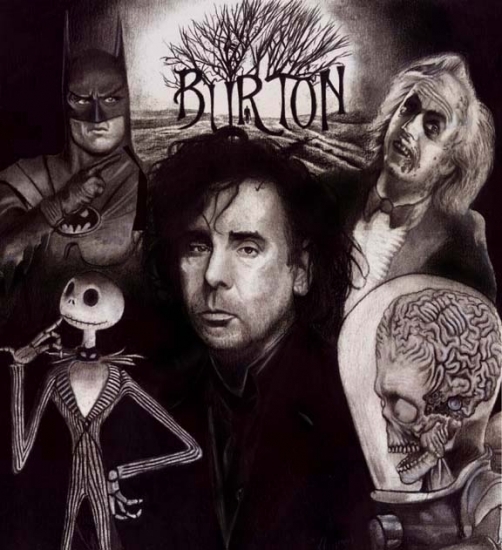 Between November 22, 2009, to April 26, 2010, Burton was honored with a retrospective featuring his artwork and films at New York's Museum of Modern Art. The event was instrumental in helping the institution attract a record-breaking level of attendance that year. It also reintroduced him to his own drawings, which had been "stuck in a drawer" for years, and inspired him to turn Frankenweenie -- the stop motion animated short that he made nearly 30 years ago, and that had led to him being fired by Disney -- into a stop motion animated feature. The irony of ironies: Disney wanted to finance and distribute it. "There is a twisted humor about it," Burton says with a laugh. Burton loves all forms of animation, he says, but he seems to have a particular fondness for stop motion, the process of moving objects in front of a camera ever so slightly countless times for different shots that, when pieced together, create the perception of movement. "There's something very tactile about it," he says. "There's a set and the lights, the characters are going in and out of shadows -- you see that. That's why I loved Ray Harryhausen's work. You can see the hands on it, you know? You can feel an energy to it." For this reason, he has employed it not only for the Frankenweenie short and feature, but also for The Nightmare Before Christmas (1983), which he produced; James and the Giant Peach (1996), which he produced; Corpse Bride (2005), which he co-directed and produced; and 9 (2009), which he produced. Most of Burton's films, live-action or stop motion, revolve around a character to which he feels a strong personal connection. When you're spending a year or two on a film, he says, "It's important to feel like you live or understand the character." Few, if any, of his characters seem as similar to him as Victor, the young protagonist of Frankenweenie. Like young Victor, Burton grew up feeling isolated in the suburbs, with emotionally-distant parents and a beloved dog, bullied in school and probably a bit depressed, to the extent that he was largely "non-verbal" and spent some of his free time hanging out in graveyards. Burton's films are often somewhat controversial, but the most common criticism of Frankenweenie -- namely, that it is too dark and disturbing for kids, the demographic to which it has been marketed -- is one that baffles him. "Mainly, kids are pretty cool. It may take a while for a film to break through, but usually they're pretty cool about getting what you're trying to do," he says. Moreover, he emphasizes, grownup issues have been a part of kids' movies "from Snow White on," pointing out that "there's a huge specter of death that hangs over" The Lion King (1994), and noting that in 101 Dalmatians (1996) "she's talking about batting them over the head and drowning them." Sure, it's a little unconventional to show -- spoiler alert -- a dead dog brought back to life, as happens in Frankenweenie, but Burton kept the dog's death off-screen and feels that, "In my mind, it's one of the safer movies I've ever done." Over the course of a long career that is going as strong today as ever, Burton has learned that you can't please all of the people all of the time -- and he doesn't seem terribly interested in trying to do that. He has, however, managed to please a lot of the people a lot of the time, and inspired legions of loyal fans who worship him as he once worshipped Harryhausen. Moreover, he is now embraced by the animation community that once shunned him. Indeed, this year, the animation branch of the Academy -- the directing branch of which has never recognized him with so much as a nomination -- nominated him for the best animated feature Oscar, for the second time, for Frankenweenie.